Once every three weeks on a Saturday, I go down to a warehouse on an industrial estate on the edge of a small East Sussex town and spend the morning sorting out tins of soup, baked beans and other non-perishable foodstuffs. I then transport stock, for the week ahead, to the distribution centre in the middle of town. I am joined in these tasks by three other people and we are all of us volunteers for the Trussell Trust, the Christian charity that operates Foodbank, the largest network dealing with food poverty in this country. 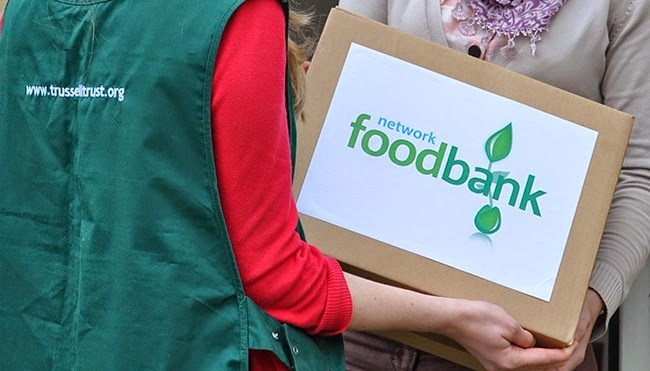 Food is donated to Foodbanks by individuals, businesses and local organisations. Mostly, Foodbanks are being used by the working poor, the unemployed and the elderly who need to bridge the gap until the next payday, benefit or pension payment, or keep away from the clutches of payday loan companies. You cannot walk into a Foodbank off the street and get free food. You have to have been referred by an agency, such as a GP practice, health centre or Citizens Advice Bureau that has identified you as being in crisis and issued you with a voucher for three days of emergency food. Last weekend, no doubt in response to the Trussell Trust’s recent revelation that it has provided a million food parcels to those in need in the last year, that bastion of investigative journalism, The Mail on Sunday (MoS), sent a reporter to a Citizens Advice Bureau in Nottingham to test the system. Having told a series of lies – he was unemployed, had two children, had fuel bills to pay - the intrepid reporter was given a voucher and then collected his food from the local Foodbank. The story was written up with the heading How MoS Reporter Got Three Days of Groceries…No Questions Asked, despite then detailing the questions about personal details, income and diet that the reporter was asked and dishonestly answered. The piece then put forward the specious argument that this one instance proves that Foodbanks are patronised by none but the undeserving poor. As a charity and not a statutory body, the Trussell Trust would not have the level of checks of a benefits agency; there is a clue in their name. As well as being the sort of casuistry we expect from the DMG Media stable, it is such a low blow against good people. My fellow volunteers at Foodbank are all Christians from local churches. I am not a Christian; I volunteer because the previous pieces I have written about Foodbank have been the most read posts on this blog, and I thought I should do something practical instead of moaning about poverty from the comfort of my keyboard. All of the Foodbank volunteers I have met are kind, well-meaning people, mostly in their sixties, and small ‘c’ conservative in their views; they are doing what they would see as the decent, Christian thing – “I was hungry and you gave me food”. Any system is open to deception but the process of obtaining help with food is not one that most people would expose themselves to lightly. There is stigma attached to accepting charity, and the admission that you are not able to feed your children is a particularly difficult one to make, even to the most sympathetic ears. However, some good has come of the Mail on Sunday’s plumbing of the depths. The social media backlash against the paper has manifested itself in increased donations to the Trussell Trust’s JustGiving campaign; since the story appeared, £50,000 has been donated in just two days. You are a dark horse. Admirable actions. All the press are biased, left, right and gutter.